In our last tutorial we have explained how to configure and perform transaction management within the database using Spring Framework and JDBC with Schema. In this tutorial, we are going to explain how to configure and perform transaction management within the database using Spring Framework and JDBC with Proxy classes. For this approach, we will have to configure a bean of org.springframework.transaction.interceptor.TransactionProxyFactoryBean class. This class is a subclass of ProxyFactoryBean class, which creates the proxy class for the target class at the runtime to take care of the transaction operations. The target class is the class that has methods for performing the transaction operations. Let's understand everything with an example. The difference between two approaches is that when we perform transaction management within the database using Spring Framework with JDBC and Annotation, we need an access to the source code to edit it and add @Transactional Annotation to class and methods involved in transaction operations. But, in case of performing transaction management within the database using Spring Framework with JDBC by Proxy, we will have to configure a bean of org.springframework.transaction.interceptor.TransactionProxyFactoryBean class using the configuration xml file. This class is a subclass of ProxyFactoryBean class, which creates the proxy class for the target class at the runtime to take care of the transaction operations. What Spring-JDBC transaction management by Proxy does? Deleting a customer account from database. Inserting a customer account record in the database. Depositing an amount in an account. Withdrawing an amount from an account. The transaction operations i.e. amount deposit or withdrawn should be atomic i.e. either of these operations should happen entirely or nothing at all. The transaction operations trying to access the shared data at the same time, should only be executed in isolation. i.e. one transaction at a time. In case of any exceptional or erroneous situation taking place(while any of the deposit or withdraw transaction operations were being performed), the effect of these operations should be rolled back to maintain the consistency of data and not leave any anomalous data in the database. Before we proceed with the example of database transaction management, we would first need to configure Spring Framework to work with JDBC. To perform this, we will use a very important template class provided by Spring Framework, named - JDBCTemplate, which provides different methods for querying and retrieving data from the database. An int property named id. A String property named name. A String property named address. A String property named age. Besides this, we are also going to define a couple of getter and setter methods within this class to set the above mentioned properties of Customer class. Getting all the account details from the database. Performing a transaction operation i.e. adding a new customer account to the database. Performing a transaction operation i.e. deleting a customer account from the database. Performing a transaction operation i.e. depositing an amount in an account. Performing a transaction operation i.e. withdrawing an amount from an account. This class is also going to contain a JDBCTemplate property named jdbcTemplate, used to configure JDBC with Spring. This jdbcTemplate property will be assigned a value by the Spring Container using its respective setter methods, when the CustomerDAO bean is created by it using the configuration xml file(to be created in the upcoming section). String query = "create table Customer_Account"
Next, we are going to create another class named - Utility, which is a simple java class. Reads XML to create the CustomerDAO bean named CustomerDAOProxyBean, which targets CustomerDAOBean and initiates its property jdbcTemplate with a value by calling its setter methods i.e. setJDBCTemplate(). Using CustomerDAOBean calls the method of CustomerDAO class i.e. createTable(), to create a table in database. Using CustomerDAOBean calls the transaction method of CustomerDAO class i.e. addCustomer(int id, string name, int amount, int age), to add a customer to the database table. Using CustomerDAOBean calls the method of CustomerDAO class i.e. getAllCustomer(), to get a List of all the customer stored in the database table. Using CustomerDAOBean calls the method of CustomerDAO class i.e. countCustomer(), to get a total count of all the customer records stored in the database. Using CustomerDAOBean calls the transaction method of CustomerDAO class i.e. deleteCustomer(int id), to delete a customer record by using its id value. Using CustomerDAOBean calls the transaction method of CustomerDAO class i.e. depositAmount(int id), to deposit an amount into an account using its id value. Using CustomerDAOBean calls the transaction method of CustomerDAO class i.e. withdrawAmount(int id), to withdraw an amount from an account using its id value. Next, we are going to add a configuration file to our project. This configuration document is an Extensible Markup Language(XML) file, ending with .xml extension and we are going to name file as config.beans.xml. In this file, we have configured a CustomerDAO bean with a unique id and its JdbcTemplate property named jdbcTemplate. These property will be assigned a value by the Spring Container using its respective setter methods, when the CustomerDAO bean is created by it using the configuration xml file. The id attribute within the <bean> element defines a unique id associated with the bean. The class attribute within the <bean> element defines the name of the class of this bean. The property child element in <bean> tag refers to a property within the CustomerDAO class. The name child attribute refers to the name of a property in the CustomerDAO class i.e. jdbcTemplate. The ref child attribute refers to the reference name of a property which is matched with the id of another bean declared in this configuration file within another <bean> tag. For example - ref="jdbcTemplateBean" refers to a JdbcTemplate bean with id having a similar value "jdbcTemplateBean", declared in this configuration file, to initiate the JdbcTemplate object. to connect to the database and perform JDBC operations using Spring Framework. In order to support the transaction operations, we have configured a bean of org.springframework.transaction.interceptor.TransactionProxyFactoryBean class. This class is a subclass of ProxyFactoryBean class, which creates the proxy class for the target class at the runtime to take care of the transaction operations. The target class is CustomerDAO class that has methods for performing the transaction operations. Let's take its syntax from configuration xml file. The name child attribute for its property "target" specifies to the name of the target class to initiate its bean i.e. CustomerDAO class containing methods for transaction operations. The name child attribute for its property "proxyTargetClass" takes a boolean value. If it is set to true then a proxy class is created by extending the target class to provide it the support for transaction operations. The name child attribute for its property "transactionManager" refers to the transaction manager bean. The name child attribute for its property "transactionAttributes" specifies the attributes of the transactions associated with each method of target class performing transaction operations, using the <props> tag and its child-tag <prop>. Using the key attribute of the <prop> child tag, we have specified the transaction attributes associated with each method of target class. A Propagation constant i.e. PROPAGATION_REQUIRES_NEW. It is used to specify the transaction behaviour i.e. PROPAGATION_REQUIRES_NEW specifies that a method should be executed in a new transaction. An Isolation constant i.e. ISOLATION_DEFAULT. This constant specifies the way of configuring the concurrent transactions i.e. ISOLATION_DEFAULT specifies that a default isolation levels defined in relational databases..
An Exception constant with a plus(+) or minus(-) sign i.e. -Exception. This constant specifies the checked exception classes and when any of the specified exceptions are thrown, the associated transaction will be rolled back immediately. We are going to add some JARs files to our Java project. These JARs are required in order to successfully execute this Spring project. All these JARs are included in the folder named libs(within our Spring installation folder). So, we need to add all the JARs in the libs folder to our build path of our Java project. Finally, we are going to add one more JAR file. This is a specific JDBC JAR file(ojdbc14.jar) required by Spring to connect to our database(Oracle Express Edition 10g) and perform database operations. Note : Those who don't know how to add JARs to the build path of your Java project in Eclipse IDE, please refer to our section Adding JARs to your Spring project in Eclipse. The picture above depicts how and where to arrange classes and interfaces comprising this Spring Project, in a specific directory structure. Project Folder - SpringWithJDBCTransactionByProxy is the name of our Project and it is a top-level directory. A POJO class named Customer_Account.java. Another POJO class named CustomerDAO.java class. A class that calls the Spring Framework into action i.e. Utility.java. Besides this, the project folder also contains a configuration file i.e. config.beans.xml, used to configure the beans of classes in the project. The project folder also contains all the needed Spring JARs present in the libs folder of Spring Framework installation. Finally, after executing Utility class, you will get the following output within the Console window. This output shown below, shows how the Utility class has used the ApplicationContext container of Spring Framework to load the configuration xml file - config.beans.xml, access the beans specified in it, instantiate the CustomerDAO class and performs JDBC operations by calling the methods of CustomerDAO class. 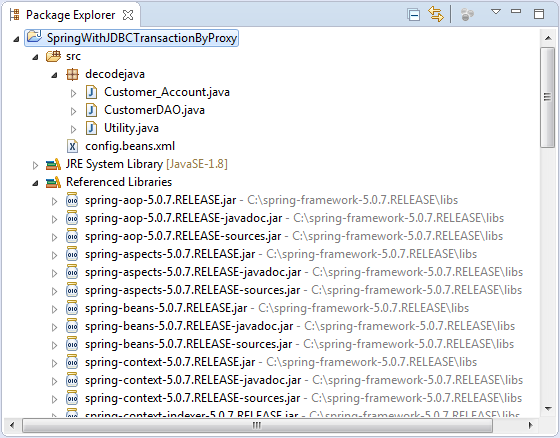 And, this concludes performing transaction management by configuring Spring Framework with JDBC using Proxy classes.